Ilan Grapel has been held since his arrest in June. A dual U.S.-Israeli citizen from Queens imprisoned in Egypt on spy suspicions since June will be released soon, Israeli Prime Minister Benjamin Netanyahu's office said in a statement Monday. The statement said Israel will release 25 Egyptian prisoners in exchange. 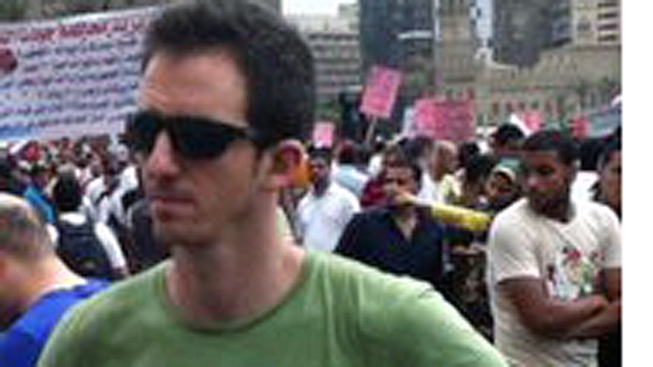 Ilan Grapel was arrested in Cairo on June 12 and has been held without charge since. Egypt's state TV confirmed that a deal was made and said the swap would be carried out on Thursday. Grapel, 27, was suspected by Egyptian officials of spying for Israel during the height of Egypt's uprising that ousted President Hosni Mubarak earlier this year. Israel and his relatives in the U.S. denied Grapel was a spy, saying he worked for a Cairo legal aid project. Grapel moved to Israel, where his grandparents live, as a young man and did his compulsory military service during the 2006 war between the Israeli military and Hezbollah, where he was wounded. Israeli news websites have published what they identified as wartime pictures of Grapel lying in his hospital bed. Grapel later returned to the U.S. for law school. Grapel graduated from Johns Hopkins University in Baltimore, Maryland, in 2005 with a bachelor's degree in international studies and was planning to return to Emory for his third and final year of law studies. Irene Grapel told NBC New York last week that her son "always wanted to do good for the world." Rep. Gary Ackerman, who has been working to secure Grapel’s release, said the young man was arrested after he had somebody take a picture of him in his old Israeli uniform in Tahrir Square and posted it on Facebook. Ackerman said in a statement Monday that Grapel's release is "terrific news." "We cannot be more relieved and gratified that Ilan will finally be freed and that he will soon be reunited with his family," he said. The Israeli government will convene a special Security Cabinet meeting Tuesday to approve the deal, the statement said. The list of prisoners included in the deal will be published so that Israelis would be able to appeal. The swap can take place 48 hours after the prisoners' names are made public. Among the 25 Egyptian prisoners to be exchanged will be three teenagers from the Sinai Peninsula, according to Egyptian security officials, speaking on condition of anonymity because no statement was made.